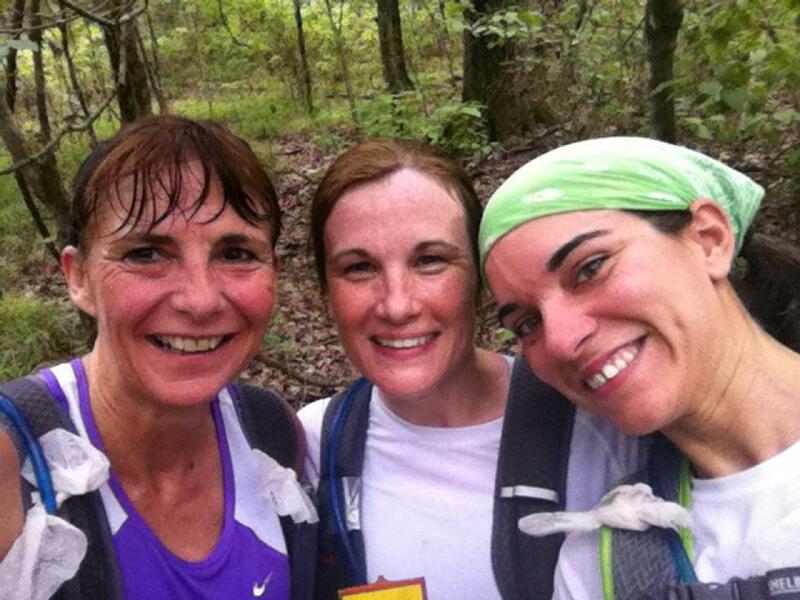 Before I recap my training week, here are some pix from Saturdays group run at Chicot! This was my first loop of the season, and I was a little concerned about how my legs would hold up to 20+ miles of trails, but I was pleasantly surprised! 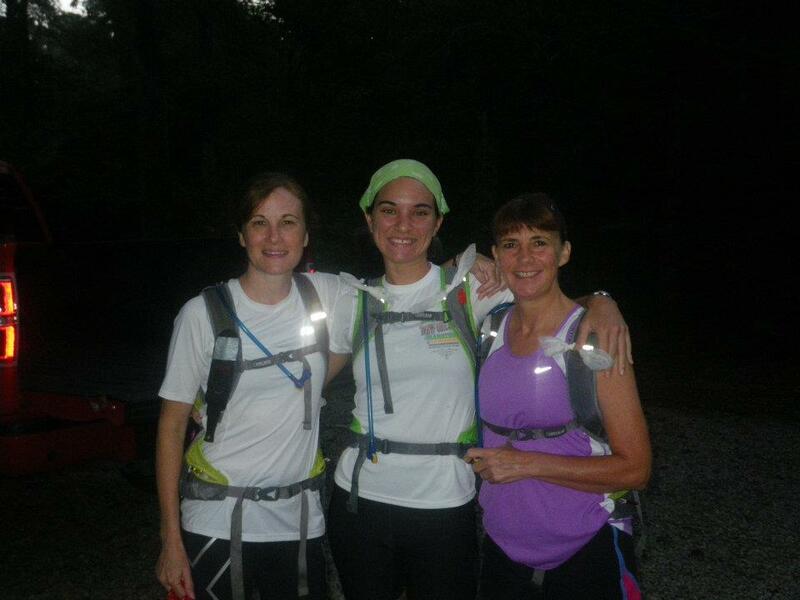 I looped with Christina and Liz, and we all ran strong the entire way! Best of all - ZERO soreness today! WooHoo!!! 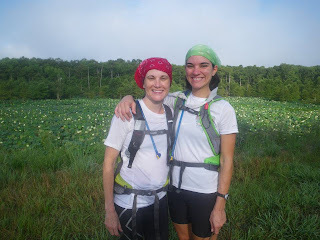 I LOVE trail running! 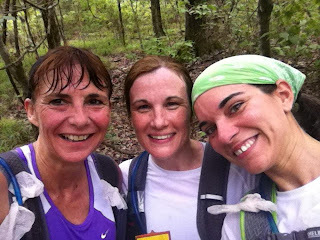 Crazy running 20 miles over tough trails for fun girls! It was Pat's first time on the trails. whole "running through the woods" thing. Christina and Liz on top of the levee - about 8 miles in. 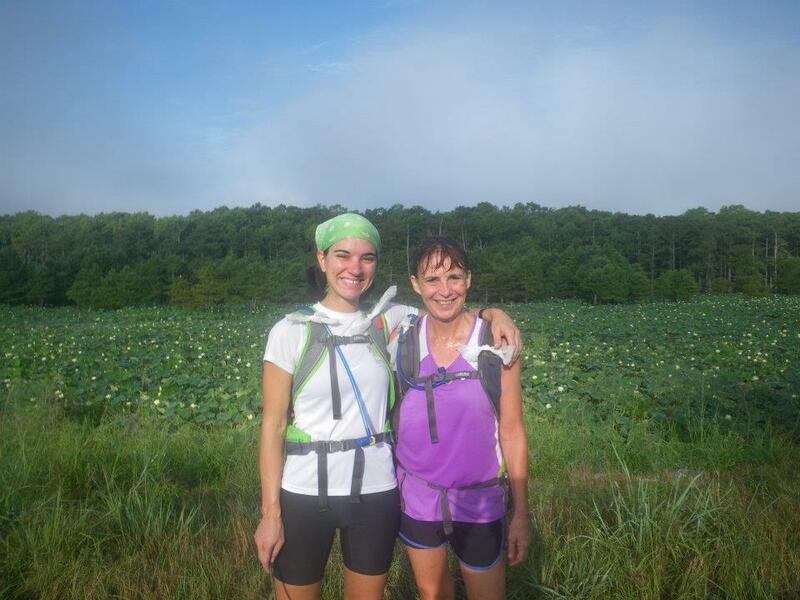 Two peasant girls on a little run. The bandannas are to keep the spiders out of our hair. At the 19 mile marker. Best quote of the day was by Christina after climbing a particularly tough hill, "Man, I'm breathing like a pervert on the telephone." The Most Likely to Find a Tick award goes to Liz this time. But it was only one, and she just picked it off of her leg. Don't freak out, people. Not sure if we will be heading out there again next weekend. I will keep you posted. This turned out to be a great training week. Considering I came off of two weeks of hardly anything, to a 24 mile week, then 41 this past week with no issues, and feeling very strong, I say all systems are a "go" for the 50k. Normally, last week and next week would be taper time, but since my schedule got a little out of whack, I had to make some adjustments. M - rest; Tu - 12; W - rest; Th - 9; Fri - rest; Sa - 20 (Chicot); Sun - rest for about 41 miles. Since I had run the previous Sunday at Chicot, I had to adjust my schedule to have Monday off, so I just ended up having three runs this week, but they were good, strong runs. I definitely have my legs under me, and I am feeling strong for my race. 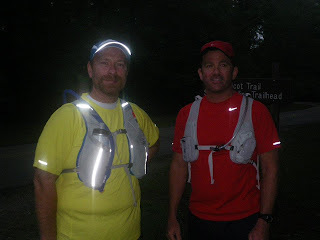 M - 12; Tu - rest; W - 15; Th - rest; F - 12; Sat - 18 - 20 for a total of 57 - 59 miles. Then I will slow down the week of the race with just a couple of 6 milers, or so. The point of this is to show you that life can sometimes get in the way, and it doesn't have to derail your plans completely. You may have to adjust your goals a bit, and be realistic with your expectations, but you don't have to throw in the towel. I have alot going on in my life, even without the added stupidness that I am dealing with. Rarely is there a time when I have NOTHING to do. Like with everything else in life, if there is something you want to accomplish, you find a way to make it happen. I am really looking forward to this race in a strange way. I reserved a hotel for the night before, and plan on driving home after the race. Hopefully the park has showers I can use when I am done, or I may be riding home with the windows down. I am looking forward to seeing the trails in Clinton, Mississippi. Who knows? Maybe I will decide to do the 100k there next year. Or maybe not. Next post will be about the role of pacers during an ultra marathon.....or more to the point - what you would be willing to do for a stick of gum?